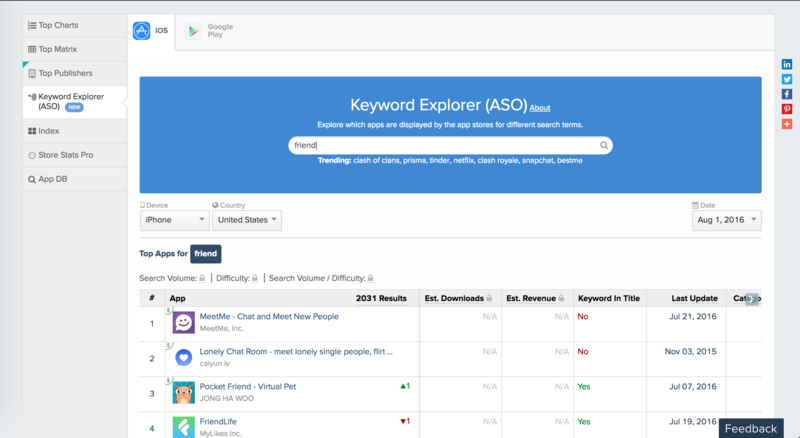 TLDNR: ASO tool App Annie expands its functionality to more solidly cover keyword research including search volume/difficulty and app download/revenue estimates. 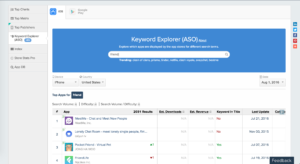 App Annie, the App Store ASO tool behemoth has finally expanded its suite of tools into an area which was, until now one of the last critically lacking yet core components of app store optimization for the company: keyword-level insights. App Annie has long been the ASO industry’s biggest data provider for store statistics, covering every major store (iOS/tvOS/Mac, Google Play, Windows/Windows Phone and Amazon) for over 500,000 customers (prices aren’t listed on the site, but can run as high as 5 figures annually for access to App Annie’s coveted competitive intelligence data) and has raised $157 million in funding according to Crunchbase. Timeline (not pictured) — a history of an app’s updates, including what changed, where and when. App details (not pictured) — preview an app’s listing, find other apps published across stores by the developer and customize a graph showing ratings counts/reviews and an index of all reviews, listed up to 200 per page. 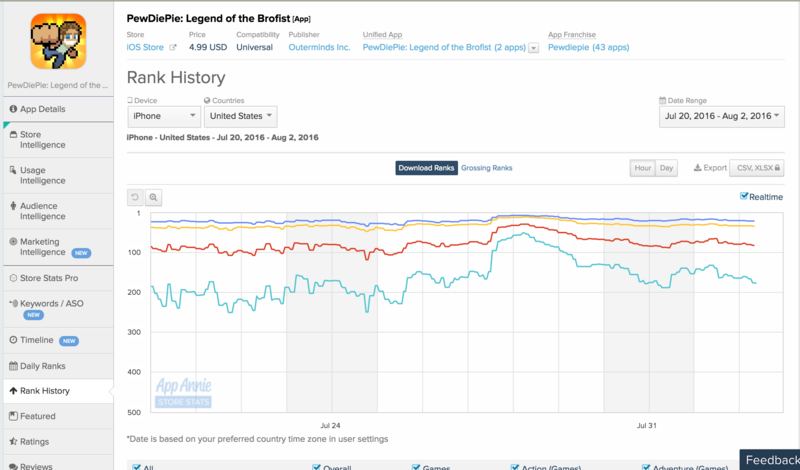 Ranking charts (below) — for an app’s categories, App Annie provides ranking data daily and hourly (for certain countries). Multiple keywords can be plotted on a graph and it’s easy and free to track keywords for any app, not just your own; though the limit of 30 keywords per app certainly is a big blocker. While App Annie still doesn’t offer a visibility score for apps, it now seems only a matter of time before this feature is also rolled out. 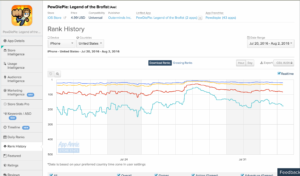 Unfortunately, the App Annie quirk that other ASO tools do not have still exists, where a maximum of about 2,000 results are ever returned for a keyword, as well as some keywords that (incorrectly) return no results if there are too few apps ranked for that keyword. Thanks for reading today! Stay tuned to the Incipia blog for ASO strategies and news, and subscribe to our email list for more app store optimization tips, tricks and hacks. Incipia is a mobile app development and marketing agency that builds and markets apps for companies with a specialty in high-quality code architecture and keyword-based marketing optimizations. For blog/video or speaking requests, business or press inquiries please contact us at hello@incipia.co. Browse our tags and categories for more related mobile app news.